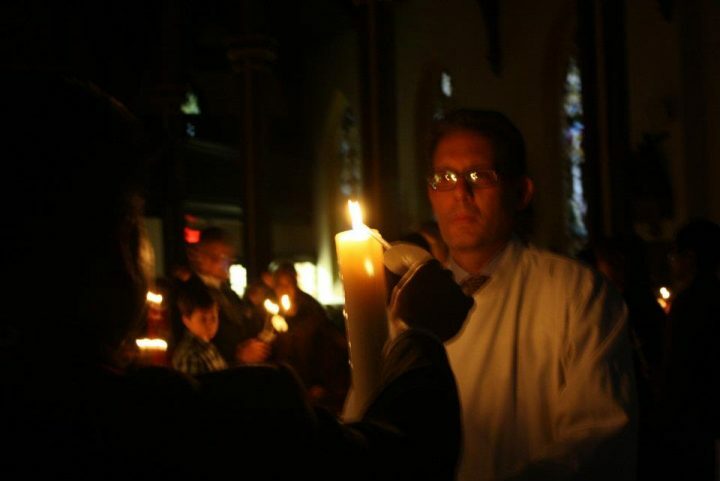 Both words – Easter and Vigil – are important. Easter is the celebration of the day in which Jesus rose from the dead. This is a very Jewish way of saying that he was reborn. Jews hold that to be human a person must have a body. To be truly reborn that body cannot be merely resuscitated (Frankenstein) nor be purely spiritual (a Ghost). Christians hold that Jesus must retain his humanity to: (1) show that his sacrifice was accepted by God, (2) create a new covenant (relationship) with God and humanity, and (3) share this rebirth and new life with us. It is this new life that Cyrus will receive when he enters the church and so there is no better day to celebrate it than Easter. Vigil means a time of keeping watch at night usually in prayer. Vigils mark extremely important feasts in the Church and there were once 16 of them. Today, the Easter Vigil is the only one celebrated in most churches. We must begin with the practical. In the earliest days of the church Vigils began at sundown and lasted until sunrise therefore they needed to bring light into churches before either gas or electrical lighting was created. However mundane, this became an opportunity to invest great symbolic value into the illumination of the Church. The other concern was what to do with all this time. Christians naturally filled the time with reading appropriate passages of Scripture and singing psalms. Please note that, although long by modern Western standards, the Easter Vigil does not exceed 2 ½ hours and consists of 4 parts. As we noted the church needed to be illuminated so a substantial fire had to be lit outside the church for people to light their candles or wicks. Easter lends itself to elaborating on this necessity. We believe that the death of Jesus has cast the world into darkness represented by the pitch-black church. With his resurrection, light will be brought back. Therefore, the congregation will assemble outside the church with unlit candles. A special candle – called the Paschal candle (another word for Easter) is brought to a burning fire. Prayers are said and the candle is given to the cantor (singer) who at the door of the church will sing “The Light of Christ.” The people will respond “Thanks be to God.” The Priest will light his candle. The cantor will lead the congregation into the church and in the middle sing again “The Light of Christ.” At this point the congregation will light their candles as well. He will then walk to the front of the church and sing again, the people will respond and then he will sing the strikingly beautiful hymn “The Exultet” from its first word “Exult heavenly powers”. Note the situation: the church that was in darkness is now illuminated by candles lit from the Paschal or Christ candle. There are many traditions from many places which have formed the present ritual but it is best just to let the symbol speak for itself. Please note: the cantor at St Charles has a powerful and clear voice and the hymn speaks for itself. I would suggest that those who are attending the service not read the text beforehand, especially if you have never heard it, and allow yourself to be moved by it. All liturgies, public acts of worship, in the Catholic church have the reading of the scriptures. As we noted a Vigil has a significantly greater number of readings. There will be 5 readings from the Old Testament that will provide the background for understanding the meaning and significance of the Resurrection. After each reading a Psalm will be sung. There will be enough light in the church for us to read the hymnals. After the last reading, the altar candles will be lit, bells rung, and an ancient hymn, the Gloria, sung. A reading from St Paul (Romans 6:3-11) and the Gospel (Luke 24:1-12) follows. Before the Gospel, a triple Alleluia is sung. This word which so expresses joy is not used in Lent, but is now sung with special vigor. Given what we have said about the meaning of Easter, nothing could make greater sense than baptizing, especially adults, on this day. This was indeed the custom of the early church, revealed by the very design of churches surviving from those days. Baptismal pools were constructed either in a separate building or in a spacious hall in the church itself. (When in Rome check out St Paul’s Outside the Walls and St. John Lateran.) Baptism was by immersion, so the person to be baptized was walked into the pool and then dunked three times. As they were naked, they were then covered with a white garment and processed back into the church. This fell out of custom, but has been revived in the last half century. You will see, however, some remnants of these very old ceremonies in our current practice. First, the baptismal font is near the entrance of the church. It is to remind us that no one is born a Christian, but becomes one through Baptism. To get to the font a minister holding the Pascal candle leads Cyrus, his sponsor, and the priest to the font. As he will be the only one baptized this year, we invite all his family and friends attending the vigil to join with him in this procession and to stand around him at the baptism. The Litany of the Saints is sung to invoke those the Church recognizes as having led the most Christ-like lives. When all have assembled the water of the font is blessed. Water is a key symbol in the Catholic Church and this prayer expresses with remarkable clarity why water is used in Baptism. It reminds us of the Exodus when Moses led the Hebrews through the Red Sea and also of cleansing and purification. At the end of the prayer, the peoples’ candles are once again lit and the priest will ask us by questions to renounce Sin and Satan and proclaim our faith. Following this, a white garment is placed on him and his godparent will give him a lit candle. While the priest sprinkles the people with holy water, Cyrus and his sponsor are led to the altar. We have used the word initiation as well as Baptism. Initiation into the church is composed of Baptism – being taken out of the world and given a relationship with Christ and his Church, Confirmation – being given the Holy Spirit to help us go from the church into the world, and finally Eucharist which strengthens and nourishes us but also pledges us to build up that world. Confirmation which now follows is marked by two signs: the laying on of hands and the Anointing with Oil. Both of these reinforce the idea that a person has been chosen and empowered. This is the central part of the Eucharist or Mass. It means “to give thanks.” Jews will note the similarity of this prayer to the Berakah prayers said in synagogues. The need to bless and thank God in our most important moments is another inheritance from the Jews. Also, the Godparent is mentioned along with Cyrus in the prayer. This is a reminder that Christians need to be strengthened, to help, and support each other. Immediately before communion, Cyrus and his sponsor will be called up to the altar and instructed and encouraged to continue along the way of Christ and Peace. The word communion itself assumes that the Christian is part of a family and community. When we say “Amen” before receiving the bread and wine now become the Body and Blood of Jesus we affirm that we are truly brothers and sisters with each other. The Mass continues as usual, except that the conclusion adds a double Alleluia to express the special joy of Easter.